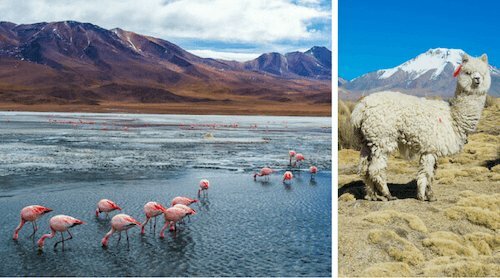 Here are some interesting Bolivia Facts which were chosen and researched by kids especially for kids. 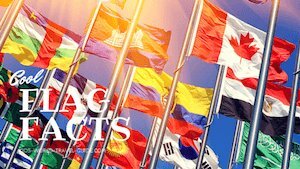 Official Languages: Spanish, Quechua, Aymara, Guarani. 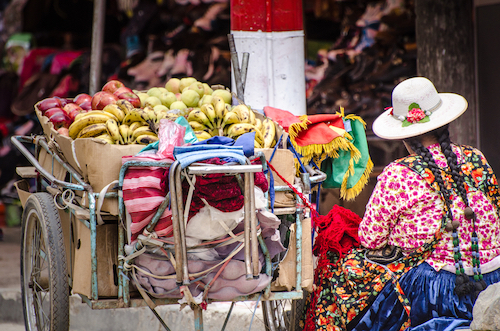 There are also 33 indigenous languages spoken in Bolivia! History: Before the Spanish started colonising the region, the area around today's Bolivia belonged to the Inca Empire. The conquistadores from Spain took control of the region in the 16th century. 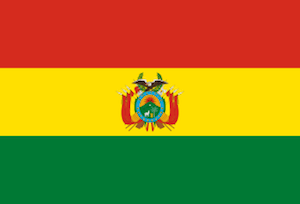 Bolivia gained independence (from Spain) in 1825. 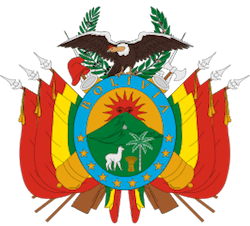 Bolivia is on the South American continent and located to the west of Brazil. 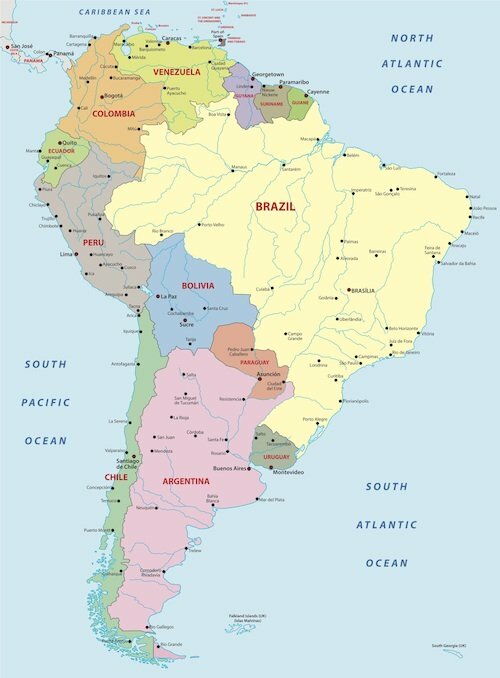 Bolivia shares borders with Brazil, Argentina, Paraguay, Chile and Peru. A flight to La Paz takes about 17 hours from London, and about 12.5 hours from New York. 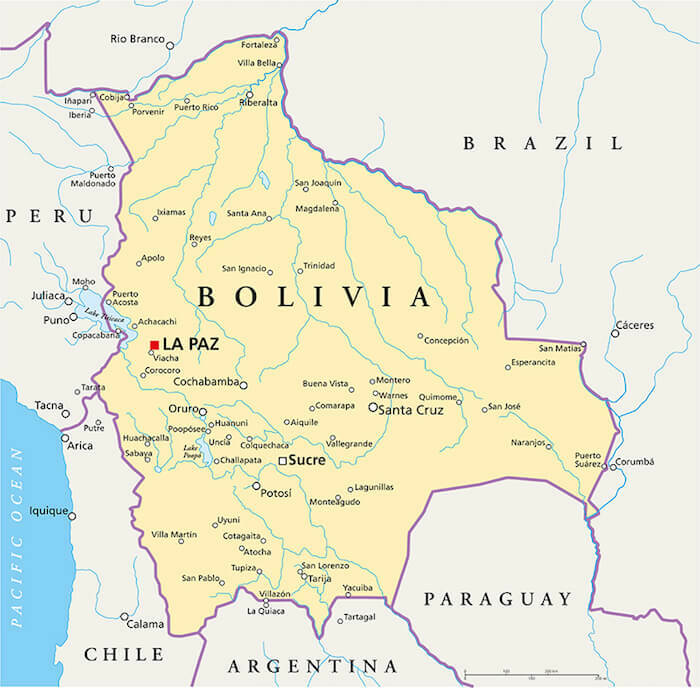 Bolivia is a landlocked country. This means it does not share any border with an ocean. Bolivia, however, claims part of Lake Titicaca, which is the world's highest navigable lake at 3,805m/12,483ft. There are regular border disputes over access to lake Titicaca with Peru, which also claims territory. The country has many different landscapes. There are the highlands with rough and icy mountainous areas even volcanoes and then there are dense rainforests in the Amazon basin. 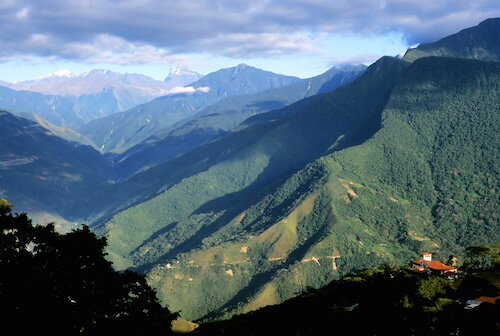 Thus also the climate is very diverse. Western Bolivia is generally cold like in the Andes highlands. The eastern side of Bolivia is warmer, and it can get very hot in the plains and humid in the rainforest region of the Amazon basin. The biggest cities in Bolivia are Santa Cruz, La Paz and Cochabamba. 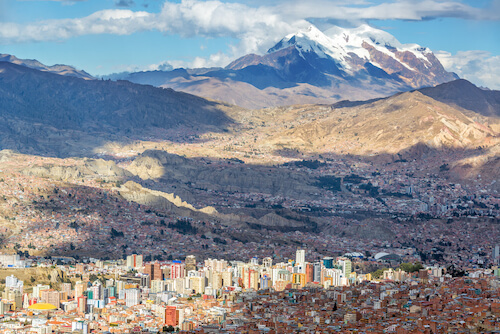 Did you know that La Paz is the highest city in the world at 3,650m/11,975ft. The highest point in Bolivia is the Nevado Sajama with 6,542m/21,463ft. There are several active volcanos in the Andes Mountains on the border with Chile. The last volcanic eruption was in 1995 at the Irruputuncu. 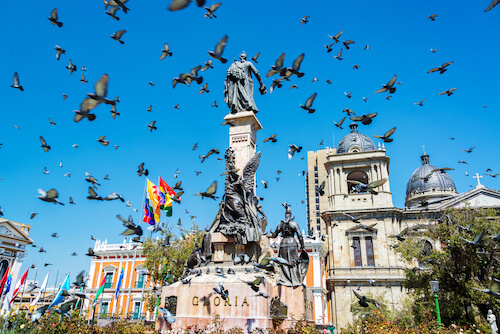 La Paz: The capital city has a scenic location in the Andes mountains and offers many attractions such as the Old Town and Murillo Square or take the cable car which connects La Paz with El Alto or visit the famous Witches' Market. Sucre: beautiful historic city and 'the other' national capital. Here the independence from Spain was proclaimed. Salar de Uyuni: The world's highest flat salt pan is located at 3,656m/11,995ft. Santa Cruz: The most important business centre in the country has many cultural attractions such as churches, museums and art galleries. Lake Titicaca: Visit the 'Isla del Sol' ('Sun Island' in English) for exploring ruins, amazing views and great hikes. Isla del Sol is the biggest island in the lake. 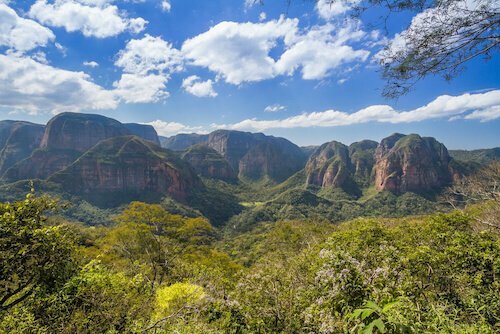 Amboro National Park: This national park in central Bolivia is famous for its wildlife. The national animals are the Andean condor and the llama. 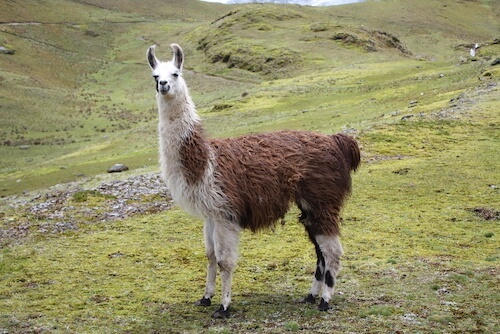 Below see a llama on the Altiplano, the Bolivian highlands. Llamas grow up to 1.8m/5.8ft. tall. They weigh up to 200kg/440lbs and grow around 20 years old. 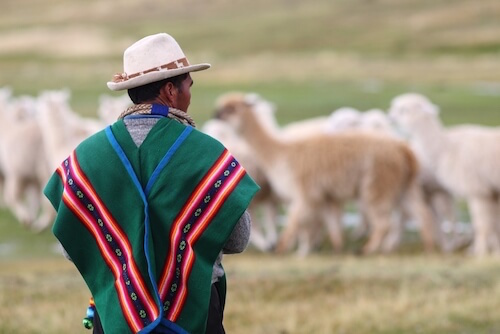 The llamas live in herds and have wonderfully soft wool. Llamas are much bigger and heavier than alpacas, they have long curved (often referred to as banana-shaped) ears and have a straight back. They have a very coarse outer coat but the wool is not as fine and silky as the alpaca's wool. 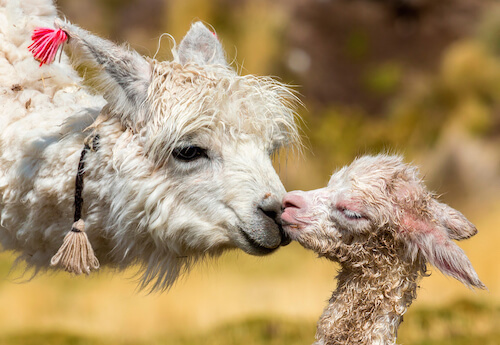 Alpacas have more hair in the face and on the top of the head. Llamas are often kept as guard animals and for packing and carrying loads. Below see an alpaca with baby. Alpaca with baby - see the tuffs of hair on their heads and the short ears, typical for alpacas! 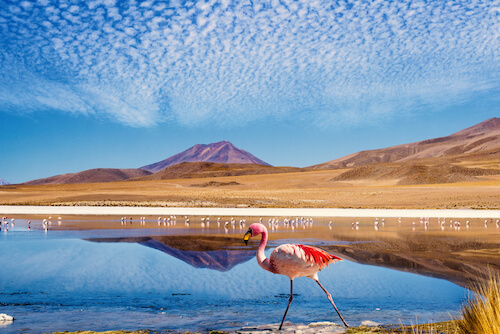 In Bolivia, there are jaguars, pumas, capybaras, chinchillas and the Andean flamingoes. 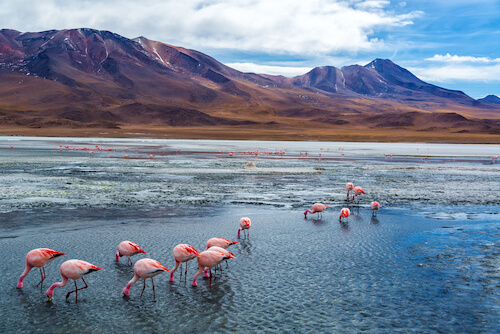 Did you know that the Andean flamingoes are the rarest flamingo species in the world? Half of all Bolivians are very poor. 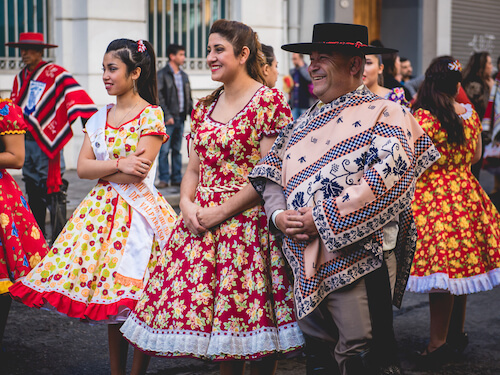 Most of the Bolivians are 'mestizo' which means they are of mixed race with indigenous white ancestors. 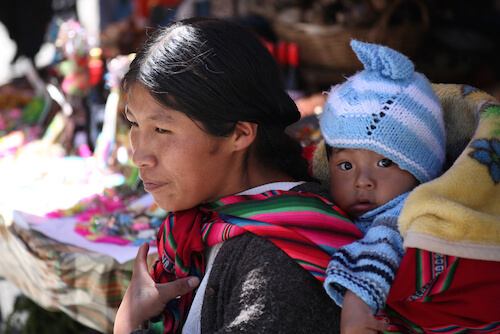 One in five Bolivians belong to the indigenous people, mostly to the Quechua and Aymara people. Bolivia is the country in Latin America which has the highest inequality of its people. There are some very rich people while the majority of the country is extremely poor. The educational standards are said to be very low especially in rural areas. 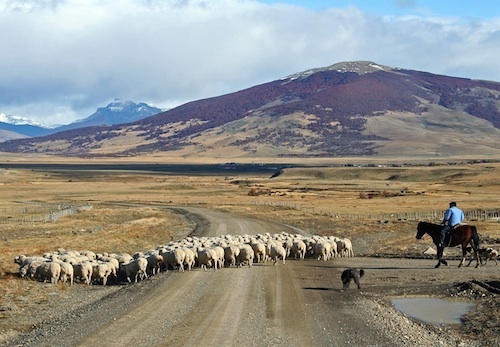 Some Bolivians have moved out to Argentina and Brazil, even as far away as the USA and Spain. This has happened in recent years as people flee poverty to have better chances in life. Many people work either in the cities, in the mines or in the agricultural sector. Bolivia produces many agricultural products, such as soybeans, quinoa, Brazil nuts, sugarcane, coffee and corn. There is compulsory military service for all Bolivian citizens. 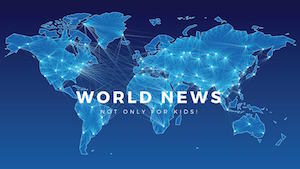 Boys and girls have to join the military for a one-year-training when they turn 18 years of age. But some boys join the army already when only 14 years old. The sports that are the most popular in Bolivia are soccer (called fútbol), tennis, swimming, horse riding and cycling. 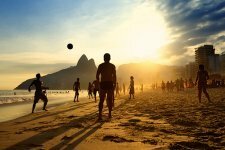 Soccer is the most popular sports activity. Typical Bolivian food consists of a variety of fruits and vegetables. However, meat such as beef, pork and chicken is also part of the traditional dishes. Fried Yuca: typical side dish similar to potato chips, but made with fried cassava (yucca or yuca) sticks. 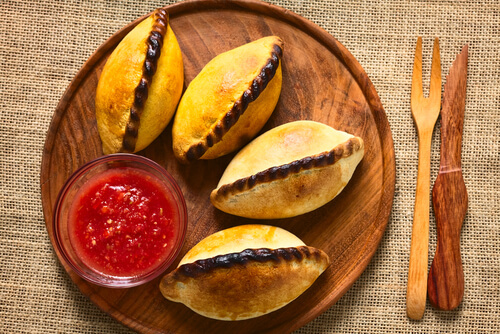 Saltenas: traditional Bolivian savoury pastries usually filled with meaty stew but often also containing eggs, olives or even raisins. 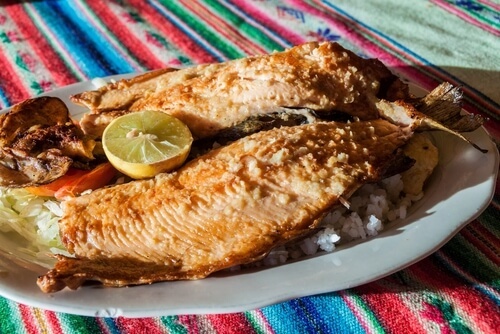 Fried Fish: Especially fried trout and kingfish is popular in the region around Lake Titicaca. 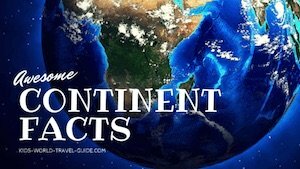 Image Credits on Bolivia Facts page: Shutterstock.com and own images. Thanks to the Grade 4 student from the Montessori Education Centre in Alexandria/USA for his input. 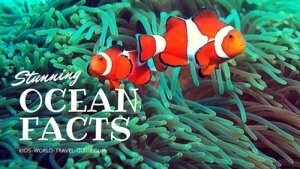 Your help is much appreciated!